North East Guides will design a programme of training and expeditions tailored to your group, with prices starting from £30.00 per person per day. Most of our DofE expeditions take place in Northumberland, usually within the National Park. We will use other areas, such as the Yorkshire Dales, if that is more convenient for your school/organisation. Our comprehensive and high quality service ensures that your life as a DofE leader will be made as easy as possible. Comprehensive pre-expedition paperwork pack for participants and parents, including consent forms and kit lists etc. Assistance with expedition paperwork. We will complete operating authority notifications, green forms and risk assessments. High quality training, delivered at a location convenient for you. Training materials and helpful handouts for participants. Supervision throughout the expeditions from experienced and friendly instructors. Accredited assessors for the qualifying expedition. Please contact us on 07786902586, 0191 4133775 or email info@northeastguides.com for an initial discussion regarding your requirements. Sample programmes can be sent out on request. If you train a group yourselves, we can provide qualified Mountain Leaders experienced in remote supervision to run and assess the expeditions. Please note we may have to charge an additional travel fee to cover costs of getting our staff to and from the location of the expedition. 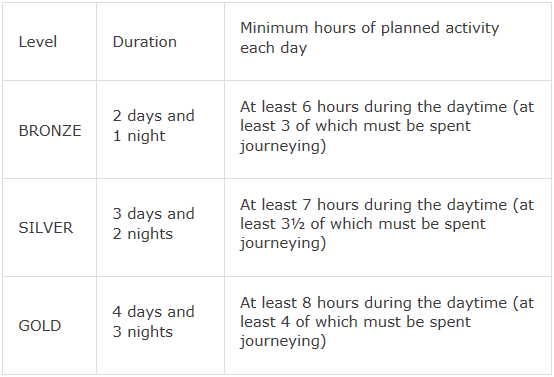 Notes: Time associated with overnight accommodation and catering is additional to the minimum daytime hours of planned activity. You have to undertake at least one practice expedition as part of your training. This may be more closely supervised than your final assessed expedition, whch is remotely supervised to develop independence and a sense of personal responsibility. We will be running Open Silver and Gold Expeditions during July, August and September. These will consist of a training day, where we will plan the route and cover any last minute needs. For more details, or to discuss your requirements, please email, or give us a call.